June 18, 2018. Riga, Latvia – His Holiness left his hotel earlier than usual this morning in order to be able to complete preparations for the empowerment and permission he was going to confer. On arrival at the Skonto Hall, His Holiness posed for photographs with more than 60 people who as volunteers had served in various capacities during the three-day teaching. 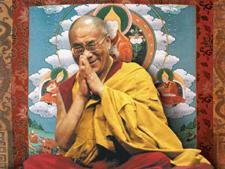 As he thanked them, he told them they should consider what they had done as of service to the Buddhadharma. Once the preparatory rituals were complete, His Holiness announced that he would confer the Avalokiteshvara Empowerment first. He explained that the people of the Land of Snows have a special connection to Avalokiteshvara. “What’s more, since the complete teaching of the Buddha, as maintained by Tibetan Buddhists, comprising both sutra and tantra, spread to nearby countries including Mongolia, people there also enjoy a special link to Avalokiteshvara. This spiritual connection between Tibetans and Mongolians first started in the 13th century, when the Sakya Lama, Drogön Chögyal Phagpa established close relations with Kublai Khan and later Altan Khan. These good relations developed further under the 3rd Dalai Lama, Sonam Gyatso, and the 4th Dalai Lama, Yonten Gyatso, who was born in Mongolia. 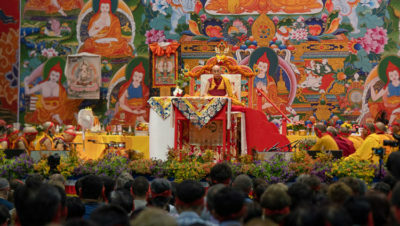 His Holiness briefly explained how important it is to adopt the right motivation for receiving any type of Empowerment—wishing thereby ultimately to achieve enlightenment for the benefit of all sentient beings. Following the Avalokiteshvara Empowerment, His Holiness conferred the permission to practise White Manjushri. As events came to an end, a representative of the organizers thanked His Holiness for coming and for the teachings he had given. She told him that Riga, where people have a chance to see and listen to His Holiness, has for many people become somewhere they go for hope and inspiration. She presented a short financial report, informing the audience that the deficit incurred in organizing the teachings would be met by private donors.